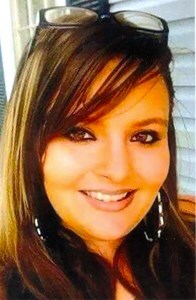 Brittney Lynn Green, 27, she passed through morning's golden gates on October 2, 2016, and walked into paradise. She had a heart larger than the ocean is wide. Brittney never met a stranger and was always there for anyone in need. She was a true joy to be around with her positive attitude and bubbly personality. She had a beautiful smile that could light up a room and had a heart of gold. She will be missed always and forever. She was preceded in death by her grandfather, Junior Green and step-mother, Tonya Green. Brittney is survived by her precious children, NahShawn Mitchell and Anaisha Brown; mother, Joannette (Paco Mendoza) Steier; siblings, Crystal Green, Maranda Ottersbach, Christopher Fudge, Kurstin Fudge and Shelby Green; grandmothers, Alberta Rentschler and Linda Green; grandfather, Michael Rentschler; aunt, Tina Steier; father, William Green and a host of nieces, nephews, aunts, uncles, cousins and many friends. Visitation will be Friday, October 7, 2016, from 1pm-8pm at Newcomer Funeral Home SW Chapel (10304 Dixie Highway). A celebration of Brittney's life will be Saturday, October 8, 2016, beginning at 1pm at the chapel of Newcomer Funeral Home. Burial will follow at Pennsylvania Run Cemetery, 8405 Pennsylvania Run Rd, Louisville, KY.
Add your memories to the guest book of Brittney Lynn Green. Brittany. I can't get you your children an your family off my mind. I'm so thankful we got to spend time togather last week. We love you an now your in a better place. An will be sharing your sweet smile with all our loved ones. We love you brittany an we sure are going to miss you. I remember when I started stake N' Shake back in June and you was training me I learned so much from you in those four days you was always a helping person you cared about everyone as if they where your family you always helped me out and had my back whenever I was struggling. I remember the talks we had in your car when you would go on your smoke breaks you told me about your kids and how they meant the world to you this still shocks me that your gone my prayers go out to you and your family I'm so happy your in a better place Rest easy beautiful. I remember when a guest fell in the corral at work, shewas right there by the guest side the whole time. When i walked over, i started praying for the man and not only was the gentleman that fell and i was praying, but she was praying as well. I wilk never forget that memory of her. I think about you everyday, I can't believe this happened to you. You worked so hard for everything you had and you were so full of life, I miss you so much but I hope heaven is all it is made out to be and you are at peace.. I love you, and I will see you friday. Her smile would light up a room. She was a very friendly person, always had a smile when I seen her...I remember her calling my name across the store when she was working at Kroger. Such a great loss, but she is with the angels now getting her wings. Rest in paradise Brittney. Brittney was a joy to be around and had a heart of gold.She will truly be missed my prayers go out the family. My God wrap his arms around you always and forever. I loved this woman with everything. She was always there when you needed her. She was always so fun and happy to be around. I'm going to miss one of the most precious people god ever made. I love you BRITTNEY rest easy baby save a spot for me. Britt. I love you so much. I miss you. It's NEVER good bye. But I'll see you later ! Believe in your family and friends. Your babies will be taken care of ! You are the best at being a parent. That void will never be filled but will be honored. I love you Brittney Lynn !! !